We are proud to invite you at UP DILIMAN for the presentation of Francesco Conte's project. A series of interviews to Filipinos living in Italy. Challenges, fulfillments and anegdotes of their living abroad. 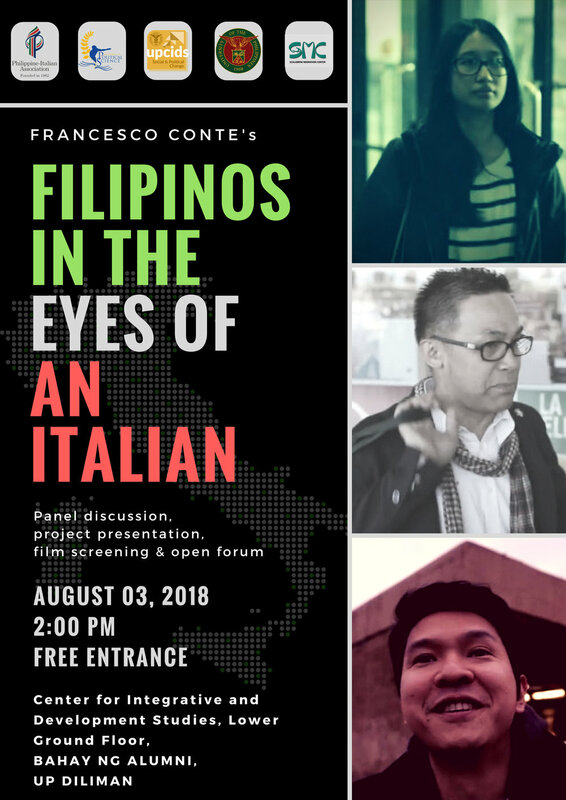 The film screening will be preceded by a academic round table on the Filipinos emigration to Italy with UP Diliman Department os Political Sciences and the UPCIDS, Social and Political Change. An open forum with the author will close the event. ADDRESS: ADDRESS: Center for Integrative and Development Studies, Lower Ground Floor, Bahay ng Alumni, University of the Philippines, Diliman. FILIPINOS IN THE EYES OF AN ITALIAN a project by Francesco Conte. Francesco Conte is a journalist and video-maker. Three years ago he launched an online channel, www.termini.tv/en, aiming to produce videos from transit places (TerminiTV takes the name from Roma Termini, Italy’s largest train station), aiming to show that that everyone move for a peculiar, individual reason. Over the years TerminiTV became a Babel of faces and voices of people we could meet everyday, without ever talking to them. For personal and travelling reasons, Francesco feels a strong attachment to the Philippines, a Country he has visited several times. Living in Italy, however, he usually meets OFW, who are often dubbed as “domestic helpers”. In this project, “Filipinos in the eyes of an Italian”, Francesco tries to give justice to them, depicting a more in-depth portrait of Filipinos in their individual lives. The interviews that will be presented by the author himself and screened will be focused on Pinoys answering questions about what pushed them to move abroad and giving them the opportunity to talk about the challenges and fulfillments of their living in Italy. - Dr. Maruja M.B. Asis (Scalabrini) on Filipino migration to Italy. - Amb. Pete Chan on Diplomatic relations of the Philippines and Italy, focusing on issue of migrants. - Fr. Graziano Gavioli (Scalabrini) on Missionary work with migrants in Italy. Entrance: Free, first come first serve.